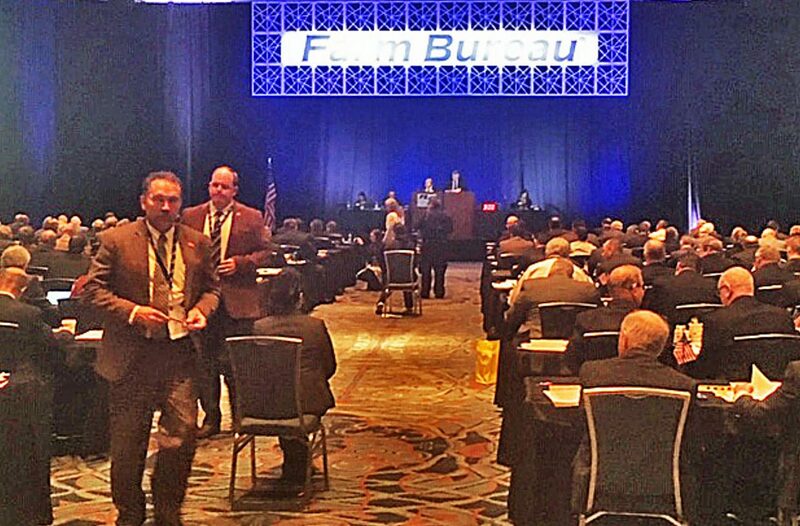 Delegates to the American Farm Bureau Federation discuss policy at their convention, with Farm Bureau President Zippy Duvall presiding. NEW ORLEANS — Delegates to the American Farm Bureau Federation convention today adopted a policy of opposing all use of the words "meat" and "fish" on labels for lab-grown and plant-based protein products. The policy statement "We support prohibiting the use of commoly known and industry recognized 'meat' terms in the labeling of advertising of all lab-grown and palnt-based alternatives" was prepared in advance of the convention and included in the policy book presented to the delegates. The prepared policy also said, "We oppose the use of any nomenclature used to refer to this product in the marketplace and on the labeling of this product, other than cell-based food product derived from meat and poultry." The policy also said "We oppose the use of commonly used nomenclature or specific 'meat' terms such as beef, chicken, pork, turkey, lamb and veal to be included on a lab-grown product label; and the use of environmental claims about lab-grown protein in the marketing of the product that is not verified by USDA as a regulatory agency and based on sound science." There was almost no discussion, but a delegate proposed from the floor to include opposition to use of the word "fish" and also "cuts of meat such as roast, steak, ground breast, chop and filet," and that language was added. The policy also says that the Agriculture Department's Food Safety and Inspection Service should have "primary jurisdiction over lab-grown or cell-culture protein." "We acknowledge that FDA (the Food and Drug Administration) may play a role in determining the product's safety, but the day-to-day primary regulation and oversight for the product should reside at USDA." The Trump administration is in the process of determining what roles FDA and USDA should play in the regulation of cell-based protein. The cell-based protein industry favors a stronger role for FDA, and other farm and livestock groups have taken positions in favor of putting USDA in charge. Immediately after the vote, Farm Bureau put out a news release noting that whether these products are called "fake meat or clean meat," these "alternative sources of protein have been appearing in supermarkets and restaurants and are competing with traditionally raised animal agriculture products." Farm Bureau said that Eric Mittenthal, the vice president of public affairs for the North American Meat Institute, said during a panel discussion here that plant-based "meats" (Impossible Foods, Inc. and Beyond Meat) and cell-based "meats" (Memphis Meats and Mosa Meat), though very different in how they are produced, are targeting the marketing demographic dominated by animal agriculture. "Their audience is not the traditional vegan or vegetarian looking for new products," Mittenthal said. "They want to compete in the meat case for meat eaters." "Plant-based 'meats' use a recipe of plant ingredients to imitate the properties of animal meat, while cell-based meats use cells taken from animals that are then grown in a lab," Farm Bureau said. Though plant-based "meats" are now on store shelves, cell-based "meats" are still unavailable. Mittenthal said that the first commercially available cell-based meat could be ready as soon as 2019 but is still too expensive to be viable as a replacement for animal agriculture products. Although some traditional meat companies have made investments in both plant-based and cell-based protein, Farm Bureau said in its release that the Animal Agriculture Alliance maintains that "many of the groups pushing for the widespread adoption of these products, such as the Good Food Institute and The Humane Society of The United States, have hostile views on animal agriculture." "These are well-funded groups opposed to animal agriculture," Hannah Thompson-Weeman, vice president of communications for the Animal Agriculture Alliance, said in the release. "From their perspective, there is no way we can raise animals for consumption that is ethical and responsible. Their end goal is ending meat consumption." But Farm Bureau noted that the panelists had warned that traditional producers could hurt their own cause as they attempt to counter the competition from the plant-based and cell-based products. ▪ Devote energy to sharing positive information about animal agriculture and meat. "Customers want choice and they need you to respect that they are entitled to choose," said Leah McGrath, dietitian for BuildUp Dietitians. "Getting caught in the middle of these ideological battles is not helpful; it just creates negativity and suspicion. Take the high road and tell your story about what makes your products great."